Twelve days ago I wrote a post that King County properties for sale was rapidly heading up to the 2009 high. 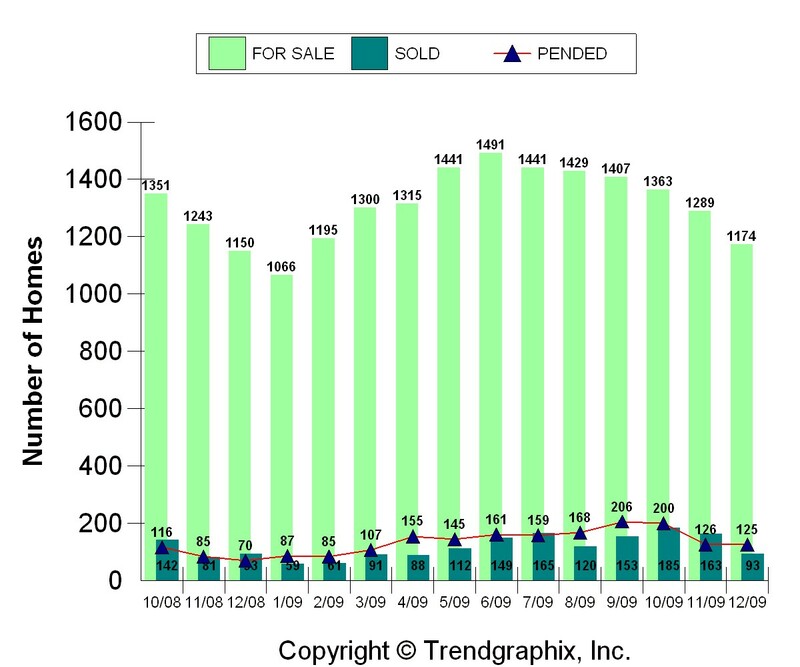 Just last week we were within 300+ homes/condos of the 2009 peak, which stands at 13,861. There 13,515 homes/condos for sale in King County that week. This week we see the first big decline, with a drop of 570 properties. The number is back below 13,000, at 12, 946. Phew, I was just beginning to wonder if we were going to surpass 2009’s real estate totals in the Seattle area. We may, as 2010 is still young, but it’s a breath of fresh air in the real estate market to see a drop in inventory (the number of homes and condos for sale). Sales have been brisk as many buyers were anxious to buy a home in the Seattle area before the expiration of the 2010 tax credit, which could explain the decline in inventory. The next few weeks will be interesting. Normally the number of homes for sale does increase in the summer months in Seattle, but I’m wondering if a lot of sellers put their home on the market earlier this year to capture the activity with the 2010 home buyers’ credit. Do you think the numbers will increase as we head into the summer? A Little Discrimination in the 2010 Home Buyer Tax Credit? 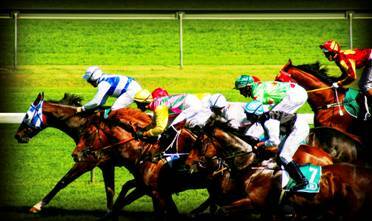 It’s very late in the game with the 2010 home buyer tax credit, the finish line is only days away. My purpose in mentioning this issue now is so something like this doesn’t happen again. The next time Congress enacts a piece of legislation such as this, there shouldn’t be any discrimination against people because they’re newly married. My team is working with a home buyer who just discovered he and his wife are not eligible for the 2010 home buyer tax credit. He qualifies for the repeat home buyer tax credit because he’s owned his home for more than 5 years. He married 3 years ago, so his wife does not meet the 5 year rule to qualify. She, of course, is eligible for the first time home buyer tax credit, but he is not. Here are some questions and answers about this very issue from the National Association Of Home Builders website’s frequently asked questions. In addition, I checked out H.R. 3548, the bill that included the tax credit, (it’s in Section 11), but it really tells you nothing. For married taxpayers, the law tests the home ownership history of both the home buyer and his/her spouse. That is, both spouses must qualify as long-time residents, with at least five years of principal residency for each. Does a married couple qualify for any home buyer tax credit in the following situation? Spouse A has lived in and owned the same principal residence for at least five years. Spouse B has lived in and owned the same principal residence for less than five years. In this situation, the couple does not qualify for any home buyer tax credit. Because the couple is married, the law tests the ownership history of both spouses. Spouse A clearly does not qualify for the $8,000 first-time home buyer tax credit, so neither does Spouse B. So, please tell elected officials not to discriminate against married, unmarried or newly married people. Everyone should have had an equal opportunity for the home buyer tax credit. 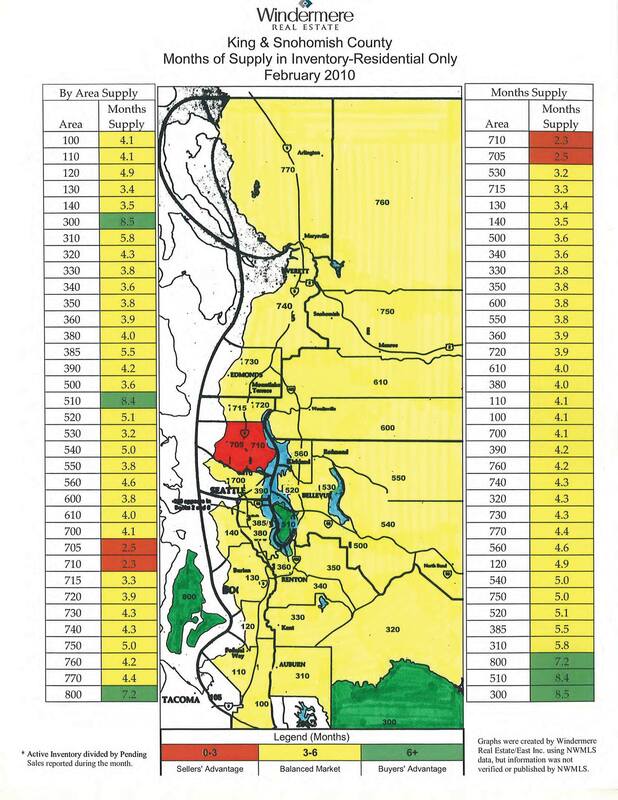 The truly “hot” Seattle real estate areas in February, 2010, those in red, are in the core neighborhoods of Seattle itself. 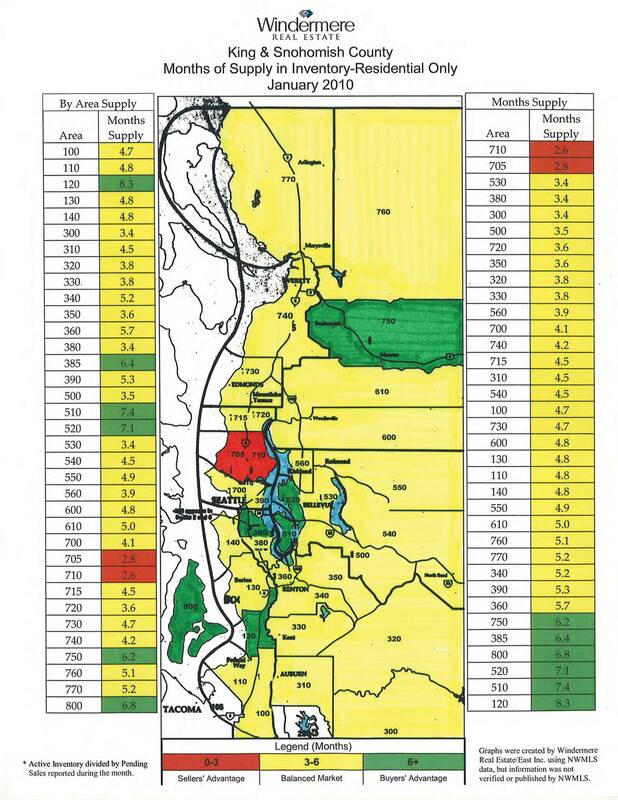 However, almost all of the map is in “yellow”, which means the average market time for a home to sell in other Seattle areas is between 3-6 months. This means we’ve had another month with a very balanced, “normal” Seattle real estate market. A normal real estate market is when supply and demand balance out to be 3-6 months to get a home sold. A balanced market is not a reflection of home values, but a reflection of the real estate sales activity. On most of Seattle’s eastside, home prices are down, but sales have gone up dramatically, anywhere from 52% to 193%, depending on the neighborhood. Prices are lower in most eastside areas, fewer homes have been on the market compared to last year, and more homes are selling. 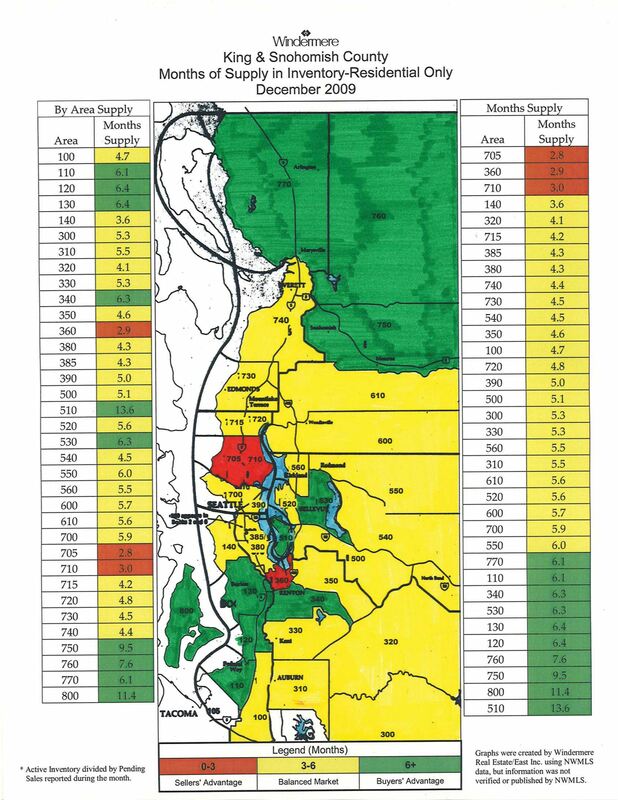 Will the colors on the Seattle real estate map stay the same in the coming months? It’s hard to answer this question now, but I do know the number of homes coming up for sale is growing pretty quickly. The increase in the number of Seattle-eastside homes and condos for sale could impact the total number of properties that sell and the market time to get a sale. With the April 30th deadline for the home buyer tax credit, much will depend on how many homes are on the market and the interest rates. Check my March eastside blog posts next month to find out what will happen. What’s your prediction for Seattle-eastside real estate in the coming months? Will “yellow,” representing a balanced real estate market between home buyers and sellers still be the predominant color on the map? 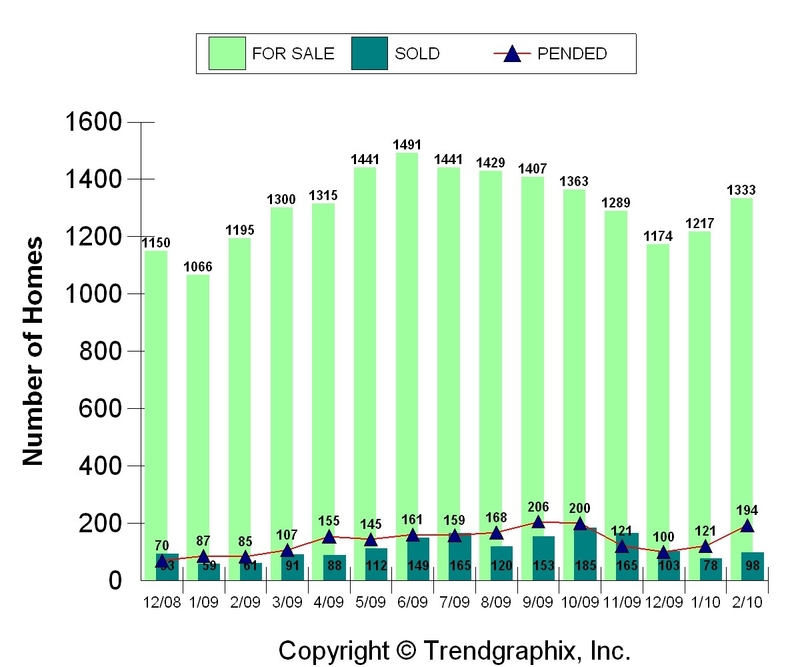 What Were The Odds of Selling Your Seattle-Eastside Condo in February, 2010? February, 2010 1333 condos for sale, 194 condos sold, 14% odds of selling. February, 2009 1195 condos for sale 85 condos sold, 7% odds of selling. *Adjusted from previous month’s original numbers to reflect the actual number of condos sold and closed. Some of the sales originally reported last month failed and did not close. Fifteen percent of condo sales originally reported in January failed to close. Some of the reasons sales fail are the buyer and seller don’t agree on the building inspection, the condo does not appraise for the sales price or the buyer’s financing does not come through. There’s been a 9% increase in the number of Seattle-Eastside condos for sale but the number of home sales jumped up dramatically. There were 73 more condos sold on Seattle’s eastside in February than in January. The sales numbers are still behind the peak of sales in September and October of 2009, but they’re inching closer to those numbers, which is a good sign. More condos are coming up on the market as Seattle-eastside home sellers traditionally put their homes on the market in the spring. The push to get a home or condo on the market is compounded by the 2010 home buyer tax credit deadline of April 30th. There are 45 days left to use the home buyer tax credit into 2010. If you’d like to move and take advantage of the tax credit, you need to get a move on! Should You Buy a Home on Seattle's Eastside Now or Wait? Should you buy a home now on Seattle’s eastside now or wait until after the tax credit expires at the end of April? Will I get a better deal now or if I wait? Is it worth passing on the tax credit and waiting to see if prices come down after April 30th? Is it better to buy now because there is a healthy number of homes for sale and good interest rates? Will there be more homes to choose from later? Will interest rates go up and cancel out any possible decline in prices? I got my crystal ball out as did many others. Money Magazine made a strong case for buying now. Warren Buffett, on the other hand, thought the real estate market would pick up in 2011. Luke Mullins of US News and World Report presented the positive aspects of home ownership, even in today’s real estate market. Truthfully, no one knows what will happen and we can only speculate about what may happen with prices, the number of homes on the market and interest rates. But all these variables should be considered when making a decision about whether to purchase a home now or later. $6500-8000 home buyer tax credit available for most buyers. Good selection of homes, many with very realistic home sellers and prices. Having the tax credit of $6500-8000 and terrific interest rates, increases buying power. Typically, your loan payment is amortized over 15 or 30 years, a lower interest rate means more dollars per month in your pocket. Will prices drop after the tax credit goes away on April 30th? No one really knows. There may be more homes on the market, which we typically see in the summer months in the Seattle area. If so, the law of supply and demand will kick in. More homes + less demand= lower prices. But we really don’t know if this will happen. We don’t know if there will be less demand. We can only guess. We can only gamble on what may be. However, there’s a good chance interest rates will go up, which means purchasing power will go down. 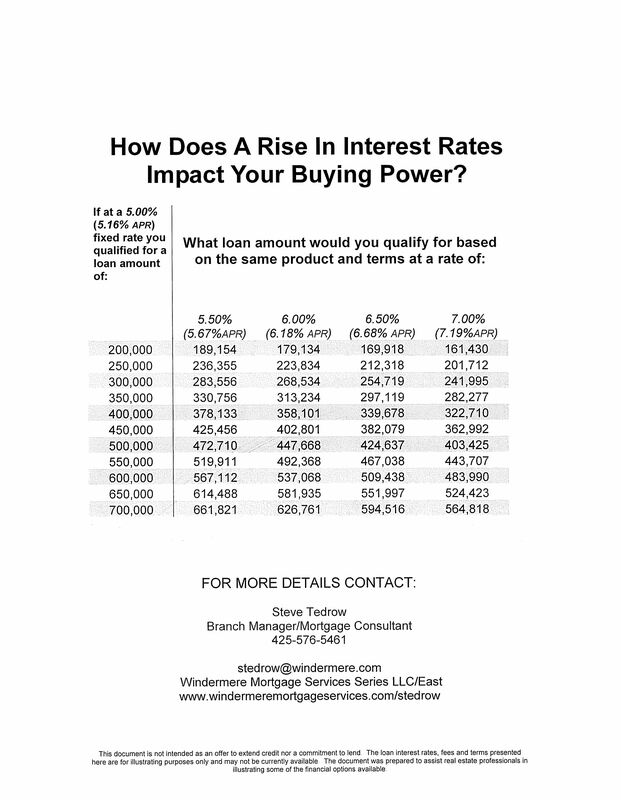 If rates go up 1%, then purchasing power goes down by about 10%. This means if you could afford a home for $330,000, if rates do go up by 1%, you would then qualify for a home at $300,000. Buying a home will, obviously, be less expensive if prices drop (but we don’t know if they will), and mortgage rates could also be a higher ( again, just a guess, but looking pretty certain), which could more than cancel out any savings in the price of the home. Remember, I’m not just talking about your initial investment, I’m talking about spreading the total cost out over the time you own your home. Some neighborhoods will be full of homes for sale and the homes in these areas will need to be priced more competitively. Other areas will have fewer homes to buy. These areas will have stiff competition among the sellers to grab the buyers. Buyers will be looking harder at the overall value each home brings them. In every real estate market, you’ll find fabulous homes. These homes will be perfect, priced right, and terrific values. Homes that shine will be the ones to sell in any market. For most people, it’s a huge personal decision when to buy and what home to buy. If you find a great house and are able to get it for a reasonable price for the real estate market at the time, it may make sense to you to buy. There are the financial aspects of buying a home and the emotional aspects. You might find the home you can’t live without and it’ll be worth it to you to buy now rather later. You may not find a home now and miss using the home buyer tax credit, but you may not want to buy a home now just to get the tax credit. There are going to be great homes now and in the future. There are also going to be great deals now and in the future. The difference in today’s market is you’re dealing with a known quantity. You have to decide what works for you. What do you think will happen with the Seattle-eastside real estate market later this year? Is The Seattle Eastside Home Sales Race Soon to Be On? Everyone who has wanted to sell on Seattle’s eastside in the last few years seems wants to sell in the next 60 days, including me. Right now, the number of homes and condos for sale in King County is doing it’s normal spring time creep up (yes, it’s spring here in Seattle). So far, the number of properties for sale isn’t unusually high. In some of the Seattle-eastside neighborhoods where I’ve sold a lot of homes and which I blog about, I’ve talked about the fact that there are fewer homes on the market. I think that may be changing and I am wondering if others are experiencing the same thing. Are other Realtors seeing the same thing happening with their business? Do you have more homes coming up for sale in the next 60 days? Do you expect to sell more homes or condos in the next 60 days because of the tax credit? Are home owners seeing more “For Sale” signs popping up in their neighborhoods? There’s a “normal” real estate market in the Seattle area. What’s a normal real estate market? It’s a real estate market in which the market is evenly balanced between both buyers and sellers, which is a good thing. Much like December, Seattle in January was “yellow,” on the map. “Yellow” means it would take 3-6 months to sell all of the available homes if no other homes come on the market. This is a good balance of homes for sale. Prices are still down and fewer homes are on the market than most of 2009, but more homes are selling. Since it’s a normal real estate market, the best homes will “pop,” selling quickly while the overpriced homes will sit on the market through a price reduction or two before they sell or not sell at all. Some homes have sold in less than a week because they are great ones that are priced right and shine above the competition. I’m seeing the extension of the 2010 home buyer credit continue to do its job of jump starting real estate sales. The first part of 2010 should be pretty active for both home buyers and sellers. After April 30th when the home buyer tax credit goes away, much will depend on how many homes are on the market and the interest rates. Who knows where the time goes? (“Who Knows Where the Time Goes”- written by Sandy Denny, but made famous by Judy Collins) Sometimes it seems like the past has gone in the blink of an eye. Ironically, it feels exactly the opposite when we think of the future. It’s human nature to think there’s all the time in the world, whereas the past seemed to happen in the blink of an eye. We have the real estate trifecta here in the Seattle area right now and it could be gone in the blink of an eye. If you’re someone whose thinking of buying or selling, if you wait too long to act, the trifecta could be a thing of the past. The trifecta is a boon for both buyers and sellers. So what’s today’s real estate trifecta? The home buyer tax credit. Attention home shoppers! The April 30th deadline for home buyers to find a home, be in contract, and receive the $6500 tax credit is coming fast, and it’s coming faster than you think. There’s less than 100 days to have an accepted offer on a home and obtain the home buyer tax credit. Remember, the $8000 tax credit still exists for first time home buyers, but many people don’t realize almost all home buyers are eligible for a $6500 tax credit. This is an important deadline for home buyers and home sellers, not just the buyers. Home buyers who are serious are out shopping and buying homes. The low interest rates, which are low, won’t be here forever. Rates for a 30 year fixed mortgage dropped below 5% last week. Good number of homes for sale. There’s a lower number of homes on the market in King County, but there’s still a healthy amount of good homes to choose from. (Yes, home buyers, there’s a number of great houses out there.) It’s a more evenly balanced real estate market between buyers and sellers, which means some homes will sell right away if they are priced right and stand out from the competition and others will take longer to sell and will sell with more negotiation in price. So home buyers and home sellers get out there now and take advantage of the real estate trifecta. April 30th is not far away.